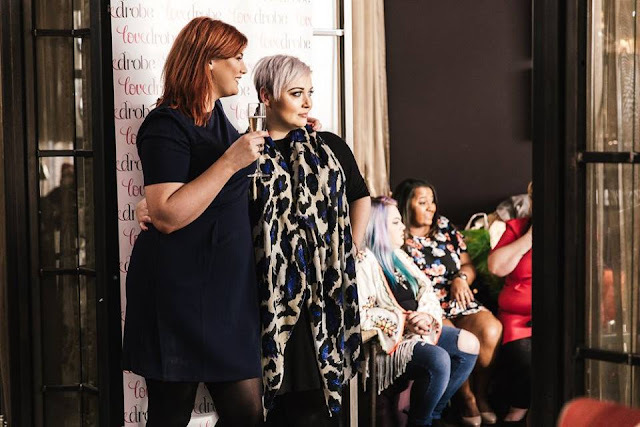 Those of you who follow me on Social Media will have seen that I was a very lucky woman indeed in being invited to a Ladies Day with Plus Size Brand Lovedrobe. I also had my makeup done by Dean who was just an utter delight - You can see on my Instagram how it turned out (Clue: There were mega borws, it was fierce and I LOVED IT). We were all asked to choose an item on the day (Yesssss!) and I was extremely tempted by the Wrapover Dress above, which was a gorgeous shape and ideal for any of the larger busted ladies in my life - Unfortunately the colour washed me out a little but if this comes out in any other colourway (Currently available in stone and white) I will be all over it. Instead I went for this Textured Shift Dress* which I have already worn to work on a number of occasions to great praise. This is such a power dress, the shape emphasises a strong shoulder and on me sits in just the right place to be both work and post-work-drinks appropriate.The textured shift dress is also available in stone and a vibrant pink which looked utterly incredible on so many of the ladies there. As you'll see on the gorgeous picture at the top of the page, there were some extremely snazzy frocks on offer and we all appear to have picked something different. Lovedrobe is fabulous for their huge range in styles, particuarly where dresses are concerned and there is something for everyone. What I will say with Lovedrobe is to be careful with the sizing - In structured dresses with no give (Such as this one) I tend to be a 20 whereas in the dress I chose on the day (a stretchy polyester) I am a 16 - So it varies! I had such a lovely afternoon amongst some of my favourite women, all of them strong, individual and independent. A fitting tribute indeed to International Womens Day. Thank you very much Lovedrobe, you really know how to show a girl a good time!